Comparisons, it’s said, are odious, and the medieval originators of this phrase certainly had a point. It all depends on the quality–or lack of it–of the thing to which comparisons are being made. So, when the object of a comparison is Danzig, one of the most brilliant stallions of the modern era, the subject is likely to come off second best. 10% Group/Graded winners. Danzig’s other exploits included two sires’ championships and he went close to siring winners of each of America’s Triple Crown events. The one that got away was the GI Kentucky Derby, and even then he was responsible for two runners-up in Stephan’s Odyssey and Hard Spun. Another of Danzig’s sons, Polish Navy, made amends for his sire’s omission by siring Sea Hero, the Kentucky Derby winner of 1993. As if all that wasn’t enough, Danzig gave European racing two of its most influential stallions in Danehill and Green Desert, while a third son, War Front, now has the distinction of being the highest-priced American-based stallion, at $250,000. Clearly War Front has inherited much of his sire’s talent, even if he is unlikely to match most of Danzig’s extraordinary statistics. And while War Front has stepped into Danzig’s shoes at Claiborne and bears a strong physical resemblance to his sire, it isn’t fair to make direct comparisons between a son and father when their respective retirements were separated by no fewer than 26 years. The Thoroughbred breeding industry has changed a great deal in that time, crop size being one of the biggest differences. Danzig’s biggest crop numbered only 59 named foals. While War Front’s numbers are conservative by today’s standards, his recent crops have usually contained more than 80 named foals. I think it is fair to say that a bigger crop size makes it harder to produce high percentages. 2- and 3-year-old crops of 2018 were sired at six-figure fees and his 2019 2-year-olds are his first sired at $200,000 or more. 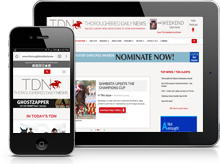 One thing that father and son do have in common is that their appeal to European owners and breeders, and their progeny’s frequent penchant for turf, has surely limited their impact on America’s Triple Crown events. The victory of War Front’s son War of Will in the GIII Lecomte S. on dirt, with its 10 Kentucky Derby points to the winner, made me look through the Triple Crown results of the past eight years to see how many runners War Front has had. The answer was that he has had no runners in the GI Belmont S., which is hardly surprising in view of War Front’s racing career. Most of his earnings came over sprint distances, although he did gain his first stakes success over 1 1/16 miles as a 3-year-old. War Front has had only one runner in the GI Preakness (the 2013 sixth Departing) and just two in the Kentucky Derby. The first, Soldat, finished 11th in 2011; and the second, Lines of Battle, traveled from Ireland to finish seventh for Aidan O’Brien in 2013. No doubt there will be more to come from War Front’s higher-priced crops, which include so many youngsters out of mares by Galileo and his sire Sadler’s Wells. Both these stallions are noted sources of stamina, but War Front’s speed has often counteracted this staying power. None of War Front’s five black-type winners out of Galileo mares, which include the Group 1-winning siblings U S Navy Flag and Roly Poly, has so far won beyond a mile. Interestingly, the five include Fog of War, who defeated War of Will by 3/4 of a length in the GI Summer S. on turf last September. Rather surprisingly, pretty much the same applies to War Front’s four black-type winners out of Sadler’s Wells mares. The partial explanation for this is that the Group 1/Grade I-winning siblings Brave Anna and Hit It A Bomb are out of Liscanna, an unusually fast daughter of Sadler’s Wells. However, the speedy French colt The Brothers War was out of Moon Queen, a Group 2 winner over a mile and a half. So where does this leave War of Will, who has inherited War Front’s effectiveness on dirt? He is the third black-type winner produced by Visions of Clarity (Ire) (Sadler’s Wells), following Pathfork and Tacticus. Pathfork, a son of Distorted Humor, rounded off his unbeaten juvenile campaign with victory in the G1 National S. over seven furlongs but never won again. Tacticus, a son of A.P. Indy, showed plenty of stamina in Britain and the U.S. Visions of Clarity was a Listed winner over a mile at three in France, but a disappointing effort over a mile and a quarter saw her dropped back to seven furlongs on her next start. With Sadler’s Wells as her sire and Imperfect Circle (Riverman) as her dam, Visions of Clarity is very closely related to Nureyev’s outstanding miler Spinning World, who numbered the Breeders’ Cup Mile among his numerous highest-level victories. Imperfect Circle was fast enough to finish second in the G1 Cheveley Park S. over six furlongs. This family has also produced the champion American sprinter Aldebaran (Mr. Prospector) and the GI Atto Mile winner Good Journey (Nureyev). The emphasis, therefore, seems to be on milers. However, Sadler’s Wells did sire the GI Prix de l’Arc de Triomphe third Sagara from Visions of Clarity’s half-sister Rangoon Ruby (Kingmambo) and his other good winners from this family include Saddex (GB), a dual Group 1 winner at up to a mile and a half; and Chief Contender (Ire), winner of the G1 Prix du Cadran over 2 1/2 miles. 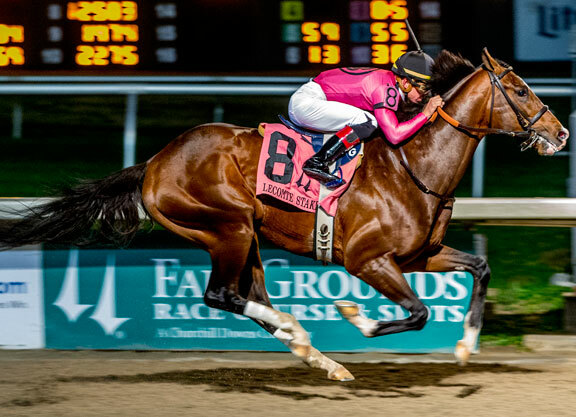 It’s therefore not impossible that War of Will will stay well enough to become a Kentucky Derby contender, but his eagerness to race may not help his cause.